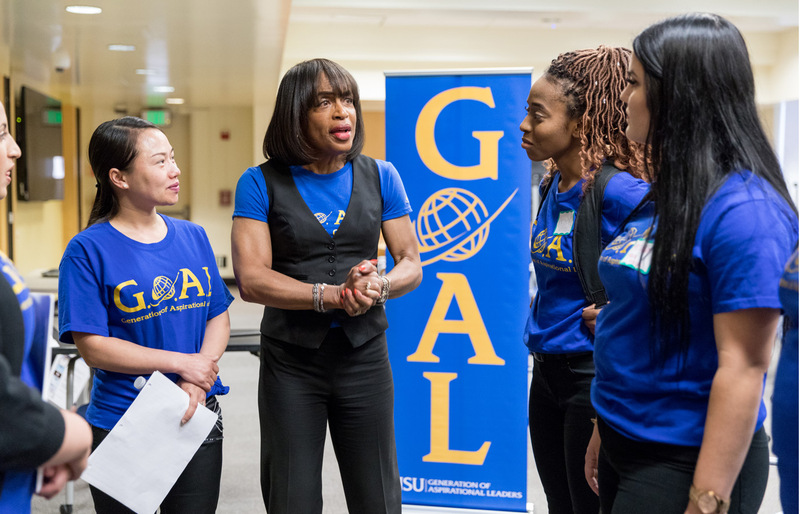 Throughout her sixteen years as an academic and marketing professor at San Jose State, Marilyn Easter would often mentor students who felt underrepresented and disenfranchised, both in college and in the business world. Ever the expert marketer, Easter recognized a demand for service—and an opportunity to offer career advice, and educational and emotional support to the SJSU community. Together with her teaching assistant Alora Frederick, ’18 Business Administration, and colleagues from the Lucas College and Graduate School of Business, Easter founded the Generation of Aspirational Leaders (G.o.A.L.) program in 2017. The program offers monthly workshops centered on community, curriculum and career. By learning how to brand, market and develop the G.o.A.L. program, students apply real-world business skills while networking with hiring managers and building professional relationships. In the spring, 2016 G.o.A.L. members attended a leadership retreat at Asilomar. Still in its pilot phase, the program has increased from five to nearly 300 members in one year. Easter hopes to scale the program to accommodate the increasing demand for mentorship, job training and campus community. The return on investment is undeniable. Next story Job Maestro: Is Your Workplace Inclusive?